Mayor Tracey Roberts with emergency services volunteers (L-R) Mel Vaz, Rob Ross and Mathew Burke. 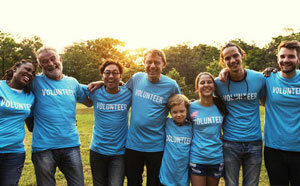 Take a fascinating and different look into volunteer recruitment and retention for your community group. Discover how to attract, retain and work with all age-groups. This workshop will be facilitated by Volunteering WA.